If I could only bring three things with me on my book tour, I’d choose pens (you can always find something to write on), a manually winding watch that doesn’t require a battery, and copies of the books I’m touring behind. Note how shiny and new those books are right now, at the beginning of the tour. They won’t stay that way. The Finch copy will get all tattered and torn and marked up from me using it to read from. The Booklife copy I plan on turning into a keepsake by having readers at events sign it. By the end of five weeks it will be full of signatures. It may also be tattered, but I kind of like that idea. It should have some signs of having gotten out into the world. I’ll discuss some ways in which modern book tours are more like playing three-dimensional chess on November 2, when my tour really begins to kick into high gear, but for now, a few images from my preparations with accompanying explanation. Also check out my post on my personal blog about the organizational principles of a book tour. If you have the resources, a lot of “tech” can go into a modern book tour. —I’ve bought a $300 mini laptop for the road, so I can still communicate the way I need to but without lugging my rather heavy regular-sized laptop around. Ironically, because my usual laptop is three years old, the mini computer is more powerful. —The GPS pictured is essential for a five-week book tour with 27 stops in 35 days. —There will be times when I’m not near a wireless signal, and so I need a battery supplement for my phone so I can communicate and receive email anyway without worrying about running out of juice. On the low-tech side, new glasses with transition lenses are convenient and look a lot better for events than my run-down old pair. 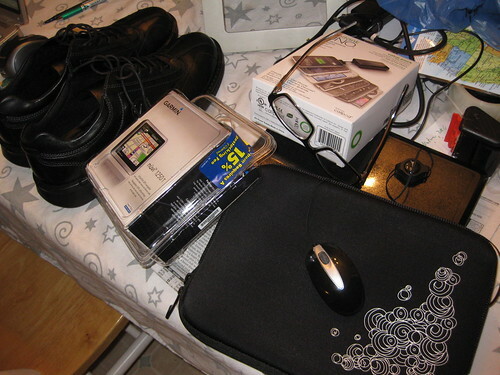 As for shoes, the same principle applies as with the mini-computer. I’m looking to save space. These Ecco shoes are comfortable for walking around a lot and also dressy enough that I can use them in both casual and formal settings. That means I’m only packing one pair of shoes–cross-trainers for the gym and any hiking. 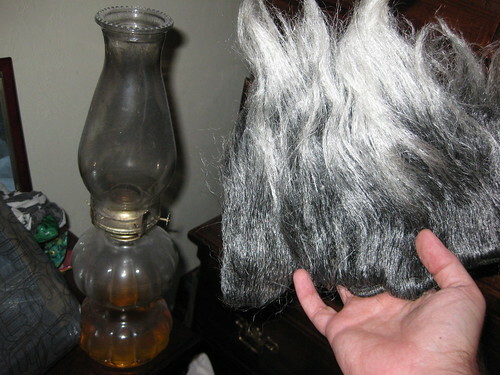 You’ll note that although these items are being used for the book tour, the investment is long-term, in that I’ll use all of this after the tour as well. In some cases, the book tour just prompted me to acquire what I should’ve gotten a long time ago. 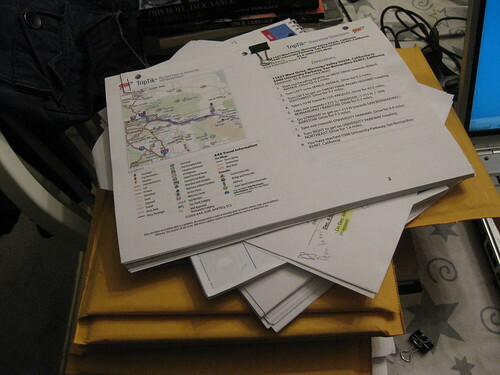 A GPS is good, but a full AAA-mapped print-out of all travel for the five weeks is important, along with state maps, not just as a back-up, but to have a full understanding of everything you’re doing. My wife Ann prepped these for me, and it’s accompanied by a detailed day-by-day itinerary. If I have time, I will also have little mini-itineraries for each day that are laminated and fit in my pocket. The itineraries include all transportation and relevant contact information. The more organized this aspect of the tour can be, the less possibility of time spent figuring things out on the road. These are just a few of the items that reflect the planning behind a well-run book tour. What haven’t I touched on that you’d think is important? Jeff, thinking of the follow-up to the tour, you may want to post and share some of the live moments. A digital recorder (audio/video) would come in hand – something easy and flexible that you didn't have to rely on someone to set up and run (who knows, you could do a "Neil Gaiman" episodic reading). You may want to print a set of business cards or bookmarks with your name/website/book title that people will easily take home and use when they're online. Just some random thoughts, I'm sure you've already considered them all and more. Great site, congratulations. Give my regards to Ann. Take care. Luis: Thanks for your comment! We've got people doing podcasts of some of the cooler events, like a discussion of fantastical cities. We might also do that for some readings. The main constraint is the nature of the tour–so many events so close together, in so many different contexts, require a lot of prep, even up to the day of the gig. I'm doing workshops, lectures, humorous talks, in addition to readings. If I was doing one or two things like Gaiman, this would be a great idea, and I definitely recommend it. Yep, business cards. Bookmarks I'm not really as fond of. Because of the amount of planning necessary, my business cards for Booklife will actually get to me during the first couple days of the tour. A good example of how a small but very important detail can get overlooked despite being organized. I said I wouldn't look till Tuesday. I lied. I looked! 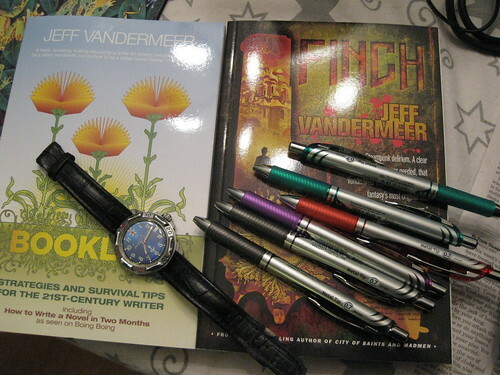 I love that photo of Booklife, Finch, pens, watch. Yeah, baby. Go get 'em!